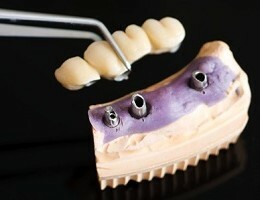 Tooth bridges or dental bridges are prosthetic appliances that are fabricated for the patient’s mouth to replace a tooth or a few teeth that have been lost. As the name implies, the construction of the prosthesis is likened to a common bridge when a particular gap or space is to be filled. Utilizing the stable natural teeth within the jaw, the bridgework composed of artificial teeth will be installed. It seems fairly easy when you think about it. Tooth bridges are constructed to connect one tooth to another, within the arch, but it is surely more than that. Some patients will insist on a treatment plan they believe is appropriate. It is often common for patients to assume that they know a thing or two about dentistry.Dental professionals are trained to deal with different patients; and when they are faced with patients who think that they “know-it-all”, they maintain their position and they strive to educate the patient. – The designing and designation of abutment support is governed by Ante’s Law which states that the total surface area of the artificial tooth be more than or equal to the total surface area of the abutment or supporting teeth. By following this, you are made certain that the abutment is strong enough to carry the entire prosthesis, well enough to restore the function of the teeth in the patient’s mouth. – As long as it is possible, it is best to section the tooth bridges per quadrant or area, instead of combining them and having them as a single bridgework. This may only be indicated when the extension is required to strengthen the prosthesis; but if it is not necessary, it is better if you divide them because this design is more ideal for cleansing and repairs. If any portion of the bridgework requires replacement, dislodgement, repair or cleaning, you do not have to deal with the complication of removing a very expansive design; you can merely designate the treatment to the given section and spare the rest of the tooth bridges. – While tooth bridges seem more simple and the linkage affords it much strength, function and stability, when dental crowns are being fabricated for a patient where there is no missing tooth, single-unit crowns are the best option rather than a bridge (unless otherwise indicated) because it is more aesthetically pleasing, it is highly cleansable and it is more ideal for future repairs and replacements. – Cantilever tooth bridges are those that have support found only at one end of the bridgework and not on either side. This is designated for distal free end cases where the most posterior teeth have already been lost. To compensate for the insufficiency, more abutment or support is assigned on the “anterior” end of the bridgework to provide proper support. Note that in this case, Ante’s Law should still be satisfied for the bridge to be successful.